Interests:Psychedelic chill out-, psyambient, ambient and experimental music. 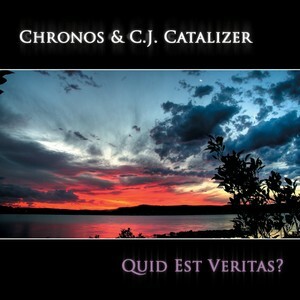 It took a while but finally it is coming, the second album by Chronos and C.J. Catalizer. Quid est Veritas? is a beautiful 11 track album. The album is coming with a 12 page booklet, each song has its own page. Only 1 1/2 weeks left untill releasedate. And good news for you! If you go to http://www.ajana-records.com/ajacd011.htm you can download the track 'Spiral Clouds (Kumharas Edit)' as an mp3 in 320 kb/s. thanx Paul - great review! It was looong & non-easy process of working in different locations,recordinig sessions in different studios and combining live flutes, vargan & voice together with electronica. C.J.Catalizer home studio, Chronos home studio, First Nation School Of Television Studio, Zero Cult studio, Khooman Studio.